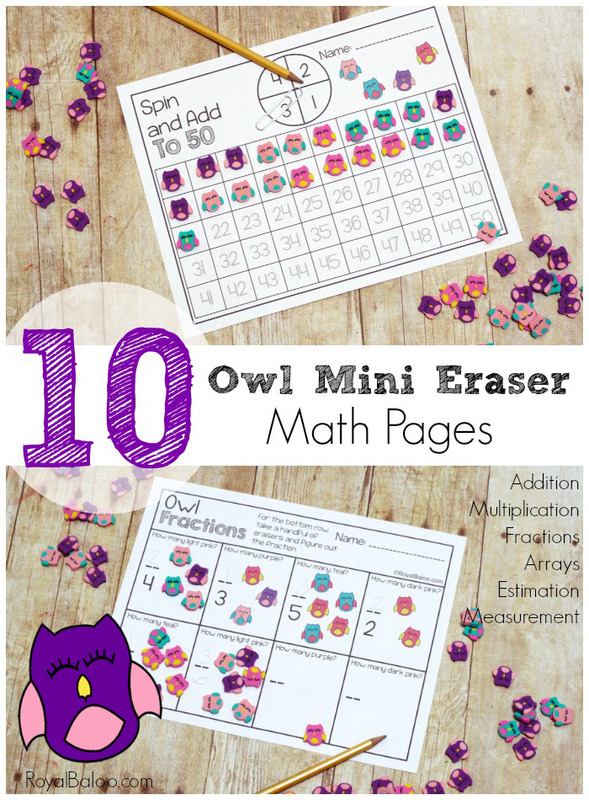 Use mini eraser as manipuatives for math! 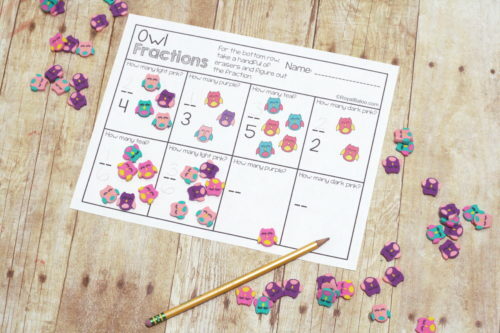 These owl mini erasers are perfect for these pages on addition, multiplication, fraction, and moreI’ve confiscated all the mini erasers in our house. It feels kind of mean but to be honest, if I don’t, they will be everywhere. In the fridge. On the toilet. All over my desk. But they are just so irresistibly cute! These pages are all no prep! 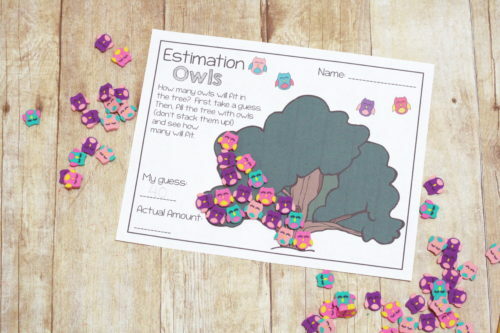 Unless you don’t have the erasers – in which case you just need to print the last page and cut out the owls! They still match the math pages so anyone can enjoy these! And you know you want to – the owls are absolutely adorable. As for the erasers – they are from Target! Target has the one spot (aka Bullseye’s Playground, I think?). It’s a little section at the front of the store with items that are about $1-$3. The erasers are not in every Target. I’ve found they’re mostly in the largest of the Targets. But search around! 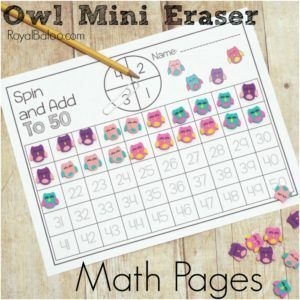 What is in the Owl Mini Eraser Math Pack? You may remember the Valentines Mini Eraser set I did recently. Well, the owl pack has all the same pages PLUS some more. You can look at the VDay page to see the original set. Scroll down to see the new pages! Estimation. 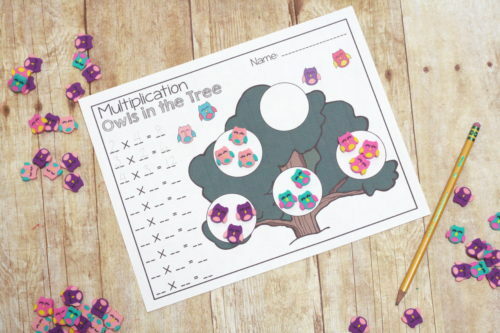 The idea is to fill up the tree with as many owls as possible. But first, guess how many will fit. Addition to 50. This is a game that can be played alone or with a partner. Simply spin and add that number of owls. We chose to use one color per spin. 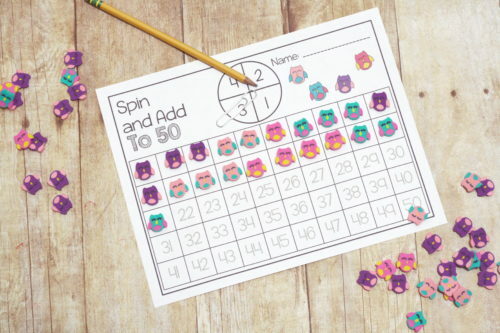 The idea is to practice counting on, reading higher numbers, and adding up to 50. Beginning Multiplication. 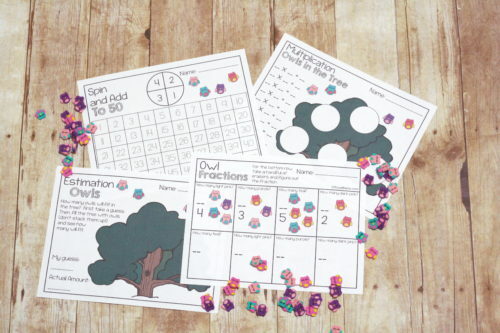 I love the idea of making simple groups to practice multiplication. 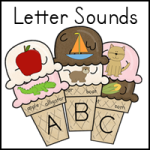 They can practice making groups (up to 5 groups on this page) and they get to decide how many is in each group. Then they can count them up to figure out the answer. This page also comes in black and white. Fractions. This is actually an original page, but it’s my favorite. On the top row, figure out how the numerator. 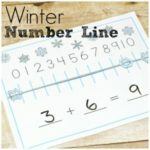 On the bottom row, pick a handful of erasers and figure out both the numerator and denominator.